Portland OPS is calling on city officials to open a facility where people can inject drugs under medical supervision, which they say reduces overdose deaths. Activists on Friday hung banners on an interstate overpass and a downtown parking garage in support of opening a place where people can safely inject drugs under medical supervision in Maine’s largest city. Safe injection sites are illegal under federal law and the U.S. Department of Justice has signaled that it will take action against communities that allow such facilities to operate. But advocates say they are proven to save lives, reduce the spread of diseases and help connect people to treatment and recovery services. The banner drop is part of a public awareness campaign by proponents. There were 180 overdose deaths in Maine through June 30, down just slightly from the 185 drug-related deaths reported for the same period last year, according to figures released in September by the Maine Attorney General’s Office. Facilities where drug users can inject drugs such as heroin under the supervision of medical professionals are more common in Europe and Canada. In January, Philadelphia became the first U.S. city to approve the concept, although it has yet to identify funding or a location. Several other large U.S. cities have discussed the idea, and Portland appears to be the first in Maine to formally consider it. The Maine Legislature considered a proposal to set up a state-sanctioned safe injection site that would have been privately run and financed, but rejected the legislation in May. 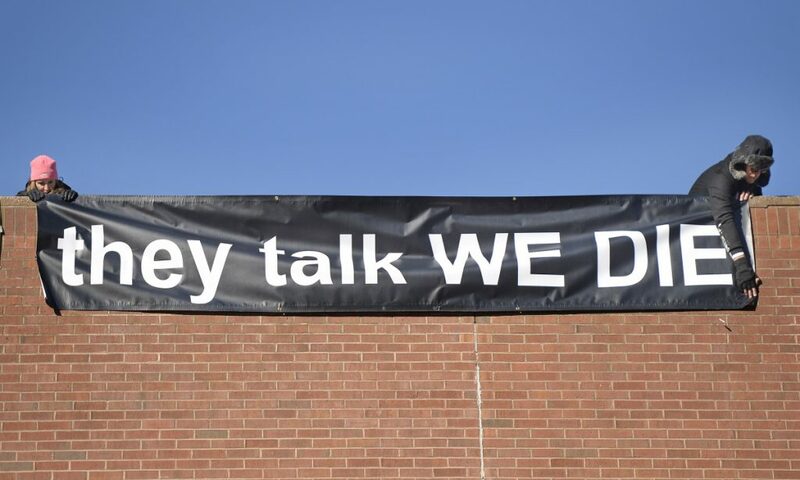 By Friday afternoon, a banner was dropped at the city’s Temple Street parking garage that said “They Talk We Die.” It hung for only a short period of time before being removed. Handschy said the messages were aimed at the Portland community as a whole, including city councilors. The activists chose Black Friday for the banner drop to maximize exposure. “There’s a lot of awareness that needs to be raised and a lot of minds that need to be changed,” Handschy said. Portland Mayor Ethan Strimling reiterated his support for opening a safe injection site in Portland. He said the City Council should make it a priority for the coming year. City Councilor Belinda Ray said she would like the Health and Human Services and Public Safety Committee, which she currently leads, to take up the issue next year. Gov.-elect Janet Mills’ plan to address the opioid epidemic does not directly address safe consumption sites. Mills was asked if she supported the concept during a lightning round of questions at a televised debate on Nov. 1. “Unfortunately, nobody’s been able to do that successfully because of federal law, so that’s a ‘no,’ ” Mills said. Mills spokesman Scott Ogden said Friday the incoming governor was focused on practical, legal solutions to the crisis. Handschy said that Portland OPS would love to see federal law changed to allow safe consumption sites. But she doesn’t think that needs to happen before communities like Portland can move in that direction. She compared it to Maine’s legalization of medical and recreational marijuana, which continues to be illegal under federal law. Handschy said Portland OPS is in communication with fellow activists in Philadelphia. “We really want an overdose prevention site in Portland sooner rather than later,” she said.